A tired-looking board, having already met since 4 pm, was a bit late to start their regular meeting at a just past 6:15pm. Chair Kate O’Connor had no opening remarks. Town Manager Peter Elwell said that parking issues, such as Transportation Center improvements and possibly charging for parking on Sundays, will be on the agenda September 4th. He also shared what he called disappointing news. After trying to work a deal for a couple of years with the State of Vermont “we were unable to agree on how to work together” at the Municipal Center regarding a long-term lease and building renovations. He said they’ve moved on to other options, but are still looking for a long-term relationship and an upgrade to the facility. He said there would be more news this fall. Shanta Lee Gander said that she and David Schoales were attending meetings of the compassion committee. She said there was a possibility of an art show that illustrated compassion through art. Gander also mentioned a compassion study group in West Brattleboro that might spread to downtown. It was being led by Doug Cox. Schoales said a speaker’s series was being arranged, to be launched next spring. They’ll be talking about compassion in work, how it is used, and how it is a part of how we function. For Public Participation, Rio Daims, speaking for Youth Vote Brattleboro, an effort to allow 16 and 17 year olds the right to vote and to serve on boards and as Representative Town Meeting representatives, told the board of frustrations with the petition system in town. “Do you have all your signatures?” asked Kate O’Connor. (Yes.) She explained that they couldn’t discuss it tonight because it wasn’t on the agenda, but could put it on the agenda in two weeks. Doing so would move it from the November ballot to the March ballot. “We really want it on the November ballot,” said Daims. She said there was momentum for the issue. Tim Wessel said he thought the process seemed complicated. Elwell tried to clear things up. He explained that for the selectboard to make a petition become a ballot issue, certified signatures from the Town Clerk had to come first. Those signatures were just delivered this Monday, well after the agenda for the Tuesday meeting was set. The board’s action had to come at a warned meeting. “There’s no barrier to being on the ballot,” he said, just not by November. Gander hoped they’d learn from this and would make the process easier and more clear. Brandie Starr said she wasn’t feeling great about the issue. Given that there was still some time if the board held a special meeting this week, she proposed just that. The board quickly agreed on a Friday morning, 9:30 am meeting to accept the certified signatures and try to get the Youth Vote on the November ballot. O’Connor reminded all that any Charter change would require legislative approval. Nick Nickerson said he thought the idea of young people who had never held jobs making decisions and laws was “obnoxious” and asked the board not to support it. We’d just put it on the ballot for people to decide,” said Wessel. “People with jobs don’t always make good decisions,’ cautioned Gander. 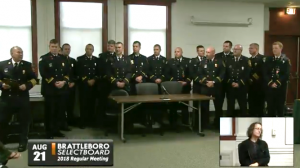 The Brattleboro Fire Department, and it looked as if just about all of them attended, formally received their First Responder of the Year Award at Tuesday’s meeting. Notice of the award came earlier in the year. The Vermont Department of Health Emergency Medical Services & Injury Prevention gave the award, which was given for the department’s excellence and leadership statewide in Emergency Medical Services support. Randy Shoonmaker of Southeast Vermont Transit, locally known as The Current, gave details to the selectboard of Brattleboro’s updated bus routes and schedules. he had given them a packet of information, and summarized it at the meeting. He said the main goals were to serve Brattleboro better by being more efficient, increasing ridership, and providing better service. Shoonmaker said that they learned the Blue Line was confusing, and riders wanted to get to Walmart and Price Chopper. There was also little ridership to and from Morningside. West Brattleboro uses the Red Line, and would like to get to Price Chopper. More hours of service were needed on the White Line, and Hannaford is a key destination on this route. The new Red Line will go from Westgate/West B. to Price Chopper (Market 32) on every trip. It will also stop at BUHS, BMH, and Red Clover, with occasional stops at the Exit 1 Industrial Park. Weekdays 6:15 am to 5:40 pm, and Saturdays 8:15am – 4:40 pm. The new White Line will have hourly service from the Cotton Mill through South Main/downtown to Bennett Drive (Supreme Fitness) via Putney Road. Weekdays 6:35am to 5:20pm, and Saturday service 10:45am to 3:30pm, and the addition of trips to Walmart instead of the Cotton Mill. The Blue Line will serve Hinsdale and Walmart in New Hampshire to the Transportation Center downtown, with a new route to the Winston Prouty Center, BMC, and Living Memorial Park. Riders will have four round trips to Hinsdale, two extra trips to Walmart, and five round trips on the new route. There will be no Saturday Blue Line. Some new stops have been added and some old ones have gone away. New service begins in October. Shoonmaker said new, easy to read brochures were being printed and would be mailed to everyone in town in mid September, and on their website sooner, to help people get used to the coming changes. Disclosure: We do the website for The Current. Public Works Director Steve Barrett received permission from the board to buy a new dump truck for the Utilities Division. Delurey Sales and Services of Hoosick, NY, the low bidder, will receive $121,954 for the truck. This comes in much under budget, which had been anticipated to be $195,000. “You could get a sweet sound system with the cost savings,” said Tim Wessel. Disclosure: When I was in high school, I wanted a semitruck with a cool sound system. The Brattleboro Selectboard gave permission to the Town Manager to spend just under $40,000 to study odors at the Wastewater Treatment Plant. The engineer will study odors with the current odor control system running, and while it is turned off. Steve Barrett of the Department of Public Works explained the project. He said the plan is to do an inventory of odor emissions, create a computer model of odor dispersions, prioritize the sources of odors then develop a strategy. An international odor expert, Robert Bowker, is to be hired for the project. Barrett said the odor control system has already been turned off in anticipation of testing next week. He also encouraged people smelling anything unusual to report it to the DPW. They’d love the feedback. The end result, he hoped, would be a plan to deal with any lingering problems. Disclosure: I have emitted odors. Brattleboro adopted the State of Vermont’s Rental Housing Code after a second reading and Public Hearing of the proposed changes. The rationale for adopting is that it will be more efficient and effective when local municipal health officers do their investigating and enforcement, though the Town Manager called it an unfunded mandate that diverted resources. Kate O’Connor asked if, come budget time, they should consider adding a permanent health and safety position, rather than have the Fire Department spend time on it. Others agreed, and Elwell promised to get them numbers. David Schoales thought it a good candidate for a hub town meeting agenda item. Elwell said it was already a part of the conversations. Disclosure: I am currently a renter. Since 2014, Brattleboro has helped the Windham and Windsor Housing Trust to apply for a series of grant funds from the Vermont Community Development Program by being the host applicant. Bruce Whitney, director of the home ownership program said this grant money supports the five county scattered site programs of the WWHT and its partner. Each year there is a request for an increase, or “enhancement,” to the grant. This year’s enhancement request is for $455,255. It will allow them to continue a home repair loan fund, homeownership counseling services, and a first time buyer assistance program. “There’s increasing need for moderate and poor people,” he told the board. He said they might soon offer forgivable loans. The grant request was approved. Disclosure: I just took an online homebuyer course through WWHT. 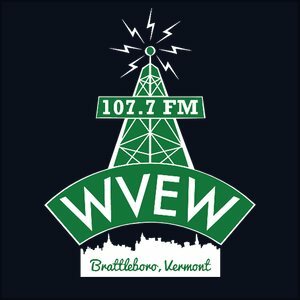 Welch Masonry will be receiving $14,250 to repair the abutment of the Main Street Bridge, also known as Brattleboro Bridge #7, also known as the Kyle Gilbert Memorial Bridge. Welch Masonry will be installing a missing granite block, about 2,000 pounds, as well as stabilizing and mortaring other areas of the abutment. Steve Barrett had an interesting tidbit: a granite block was found in the stream and they thought it must be the missing piece of the bridge, but it was the wrong size and not the missing piece. Disclosure: I know Peter Welch. The selectboard bought another dump truck. Delurey Sales and Service will receive $171,583 for this one, to be used by Brattleboro’s Highway Department. This dump truck also comes with Viking-Cives equipment, an auto lube system for the chassis and body spreader, a bolt-on stainless steel asphalt apron, and an extended warranty. It is also under the $195,000 set aside in the budget for the purchase. “No sound system for this one,” said Brandie Starr. “Will you go to Hoosick to pick it up,” asked Tim Wessel. “There’s a great English pub there…” said Wessel. “…that they won’t be visiting if they are picking up a dump truck,” interjected Elwell. Disclosure: I’ve driven through Hoosick but have not stopped at the pub. The Brattleboro Selectboard held first readings on proposed changes to the Code of Ordinances regarding taxicabs and vehicles for hire, and a change to rules for loading and unloading near Boys & Girls Club. The discussion of vehicles for hire is generally about adopting new rules to regulate Uber and Lyft types of businesses. Anyone driving passengers around for a fee will need an annual permit. You’ll need a valid license and record check, be neat and clean and abide by a dress code, and be in good health. You’ll also need $25. Then there’s your vehicle being hired. It needs a license, too. It needs to be inspected and you need insurance. This costs $100 the first time, and $50 to renew each year. Shanta Lee Gander raised concerns that in this gig economy, “the hustle economy,” where people take extra small jobs to make money, this change might make it difficult. Brandie Starr agreed that the effort to make things more fair was still slightly unfair. The loading zone revision at the Boys & Girls Club on Flat Street will allow for parents and workers at the club to leave cars unattended for short periods while dropping of people or supplies. This will change the No Parking Zone there to a Loading Zone. Disclosure: I will not be driving a vehicle for hire. Finance Director John O’Connor gave the Brattleboro Selectboard an update on the financial reports for the first month of the new fiscal year. Just 8.3% of the new fiscal year has been completed, and includes some annual expenses that make numbers seem larger than they they are when spread out over the year. The General Fund stands at 11.8% of the annual budget. The Utilities Fund is at 10.1% and the Parking Fund is at 7.5%. The Solid Waste Disposal Fund revenues at at 5.0% and the expenditures are at 3.1%, noting, as always, that bag revenue, collection costs, and tipping fees are calculated the following month. Over $4.4 million has been loaned out, and just under $470,000 is available for additional grants and loans. The Town has 35 active grants and 7 in development. Disclosure: I have no disclosure here. The new LTFP is done. It’s the five year financial forecast, and is well worth a read by everyone in town. Town Manager Elwell gave a very quick summary to the board. There’s a guess at what property taxes might be for the next five years. General Fund revenues are expected to be flat throughout the period. FY20 will be the year the Town reaches the “important milestone” of $1 million in real time cash revenues allocated to capital projects and equipment. “This is the minimum required to catch up on long-term infrastructure and equipment needs,” he said, adding that $2 million would be better until Brattleboro catches up. Use of the Fund Balance will be more limited in the next five years. Employee salaries will increase steadily. Retirement costs will go up a bit. Departmental expenses will rise, mostly due to fuel costs. Worker’s Compensation will rise. Ambulance expenses will go up. Debt service payments on current obligations will go down. Wessel pledged to be more conservative this budget season, “especially after Representative Town Meeting was so generous.” Schoales agreed. Disclosure: I agree that RTM can be dangerous. Fire Department reports 11 overdoses in July, with five from opiates. The Brattleboro Police responded to 7 overdoses. The solar energy system at the WSWMD is the largest net-metered solar array in Vermont, with 16,000 solar panels on 25 acres. I love all the disclosures. Maybe I should start doing that with my articles, too. They would probably be very similar to your disclosure on the Main Street Bridge Repair. The perils of living in a small town!